Daniel Davis, MD, UC San Diego Director of Resuscitation Science in the Department of Emergency Medicine and his team at the UC San Diego Health System will begin a new clinical trial making use of two drugs, amiodarone and lidocaine starting spring 2012 to combat Sudden Cardiac Arrest. Sudden Cardiac Arrest (SCA) is the leading cause of death in adults over the age of forty in the United States and accounts for 325,000 deaths per year. On average, 1,000 people die due to SCA every day — one death every two minutes. It is a life threatening condition that takes more American lives than colorectal cancer, breast cancer, prostate cancer, auto accidents, AIDS, firearms and house fires combined. Why then are there not more public organizations garnering support to fight SCA? A patient experiencing SCA dies within minutes. It is a condition in which the heart essentially stops beating (cardiac arrest), stopping blood flow to the brain and other vital organs. A rhythmic dysfunction caused by irregularities in the heart’s electrical system triggers SCA. The heart’s electrical system controls the rate and rhythm of the heartbeat, and any problems with either is called an arrhythmia. When the electrical signals controlling the contractions in the ventricles of the heart become rapid the ventricles begin to quiver (ventricular fibrillation) they can no longer pump blood. SCA can also result when the heart muscle does not respond to the electrical signals. Ultimately, when the heart stops contracting due to an arrhythmia the cause of death is SCA. Currently there are no drugs being used in the field to treat SCA. Patients are helpless, in that unless they receive early intervention with cardiopulmonary resuscitation (CPR) or defibrillation there is no chance of survival. 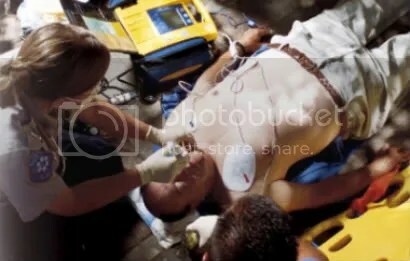 Paramedics most commonly use defibrillators to send an electrical shock throughout the patient in hopes of restoring the correct rhythm. Unfortunately, even the defibrillator does not always guarantee success: 95 percent of SCA victims die before reaching the hospital. According to Dr. Davis, endless research has been conducted over the past few years on possible drugs to decrease that percentage, but epinephrine is the only drug currently used by paramedics to raise blood pressure while doing chest compressions. “For more than 30 years we’ve been looking for an anti-arrhythmic drug to treat ventricular tachycardia, or what we call shockable rhythm, but we have not found a drug that consistently improves patient outcomes. This clinical trial will help us determine if either the drugs amiodarone or lidocaine may help prevent death.” If patients respond to some combination of the drugs then hopefully the results of the trial will be redeemed all over the United States to help save more lives. Lidocaine was the drug that many doctors had their hopes set on. It was being used in San Diego for several years but due to inconsistent results it stopped being administered. Amiodarone (PM 101) is the primary drug in question for this trial. Davis hopes to determine if a new formulation of amiodarone will improve survival. Amiodarone is sometimes given in tablet form to patients with serious ventricular arrhythmias to relax overactive heart muscles, but in this trial it will be injected while the patient is undergoing the sudden cardiac arrest in the ambulance. Arrhythmias can be either congenital conditions or can develop when part of the myocardium, or heart muscle tissue, is irritated or damaged. Either problem leads to disruption in the heart’s electrical system. Antiarrhythmic drugs work in several different ways in that slow the electrical impulses in the heart. They are often divided in into five different categories: Class I-V. Each class controls different ion channels in the heart. Class I antiarrhythmics such as quinidine, lidocaine, and moriczine are sodium-channel blockers that prevent paroxysmal atrial fibrillation. Class II, propranolol, metoprolol, and bisoprolol, are beta-blockers that decrease myocardial infarction (heart attack) mortality. Class III antiarrhythmics like amiodarone, sotalol, and ibutilide are potassium channel blockers that are mainly associated with ventricular tachycardias. 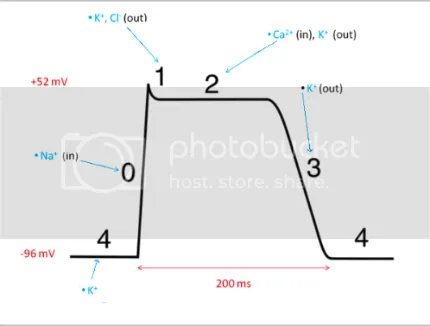 Class IV drugs such as verapamil and diltiazem block calcium channels in the AV node and they prevent paroxysmal supravetriuclar tachycardia. Lastly, Class V antiarrhythmics include drugs with historical importance such as digoxin that are rarely used but offer important research value. Amiodarone, classified as a Class III antiarrhythmic, has shown the qualities and effects of all classes, making it a promising drug to be used in the clinical trial. Dr. Davis explains that the patient who has undergone SCA is basically dead because their heart has stopped pumping. They are then in need of chest compressions and defibrillation to get their heart pumping again. The hope for these drugs is that they will improve the chances that when a shock is provided, the patient will come out of dysrhythmia, and if the shock works they will stay out of the dysrhythmia and not go back into an abnormal rhythm. This clinical trial is expected to run for about three to four years in order for enough patient data to be collated. Dr. Davis hopes that the trial can be stopped early if a benefit is found within one of the groups. Due to the critical condition SCA leaves the patient in, the trials are being conducted under Exemption from Informed Consent. It is not practical to try and ask the patient for consent or even the family when the patient needs care within seconds. “When a patient is in critical need of rapid medical treatment, the priority is to provide treatment. Every second counts to save the heart and brain.” The U.S. Department of Health and Human Services and the Food and Drug Administration have approved the trials. The drug will be administered by paramedics to patients whose hearts have stopped beating. If a family member is present, they will be informed of the study and given the option of refusing participation. The clinical trial being conducted at UCSD is one of ten different sites. Research as to what exactly causes SCA is also being done worldwide. Currently diseases and conditions such as coronary heart disease, severe physical stress, inherited disorders, and structural changes in the heart are said to cause SCA. Coronary Heart Disease usually results from plaque buildup in the coronary arteries, responsible for the supply of oxygenated blood to heart muscle. When plaque narrows the arterial walls, the blood flow to the heart is reduced, and eventually the area ruptures resulting in a blood clot. The blood clot can partially or fully block blood flow to the heart muscle, causing a myocardial infarction or heart attack. Heart attacks lead to dead heart muscle cells which are replaced by scar tissue. The scar tissue then damages the heart’s electrical system leading to deadly arrhythmias and SCA. Interestingly enough, however, several SCA patients have never had heart attacks. Some are young and healthy. For those cases doctors believe the cause of SCA could be either physical stress, inherited disorders, structural changes in the heart, or some combination of all three. Examples of physical stress that could affect the electrical system in the heart include: intense physical activity, low blood levels of potassium, major blood loss, or severe lack of oxygen. In intense physical activity, epinephrine is released and the hormone can spark SCA in patients with prior heart problems. Inherited disorders like long QT syndrome, which causes sudden, uncontrollable, and dangerous heart rhythms due to problems with pores on the surface of heart muscle, can also lead to SCA. Some families are just predisposed to arrhythmias and the tendency is inherited and passed from parents to children through genes. Lastly structural changes to the heart caused by high blood pressure or advanced heart disease can also lead to SCA. 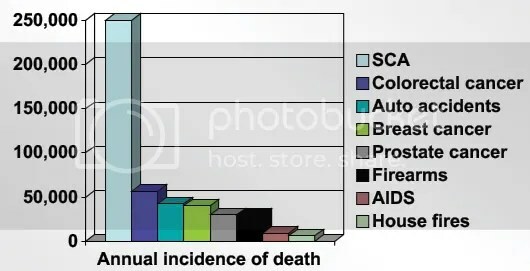 Although the primary cause of SCA is not completely known, the mortality rate remains shockingly and distressingly high. Sudden Cardiac Arrest takes lives within minutes and fortunately the government is supplying more public areas with automatic external defibrillators. Knowledge on how to use of an AED in the case of an emergency is becoming more widespread.